I have been a fan of the short story for a very long time and there were years when I read more short story collections than novels. But if you had asked me, even a year ago, if I would have been interested in reading a collection of “military and adventure science fiction” stories I would probably have thought, “No way.” But over the course of the past year (maybe two), I have read a number of books for this blog that would fall in the military or adventure sci-fi category that I have really liked. As one might expect with an anthology like this, there is quite a variety of works – some quite good and others not to my taste. One story stood out to me, head and shoulders above the rest: “Remember Day” by Sarah Pinsker. The story doesn’t deal with the actions of war, but the aftermath. It’s beautiful and haunting in such a simple way. “For the Love of Sylvia City” by Andrea M. Pawley was a nice combination of military sci-fi and ecological disaster. I appreciated this story a lot. Claudine Griggs’ “Helping Hand” was very short and simple but also quite beautiful. It’s a tale of helplessness in space. I’ve been a fan of Brad Torgersen’s work for a while now. After what I thought was a disappointing recent novel, I was a bit wary going into his short story “Gyre (the Successful Kind).” It is a pretty solid adventure story, though I couldn’t help but constantly compare the story’s hero to some cinematic adventurers (all played by Harrison Ford) which actually took me away from the story because I kept thinking that it was too much of a stereotype/rip-off of other characters. Still…a fun tale. “Twilight on Olympus” by Eric Leif Davin starts out feeling like it will be a Martian rip-off, but winds up being a sweet, though sad, story of life and reflection. The rest of the stories were just fair for me. It did surprise me that the stories by some of the bigger ‘names’ in sci-fi didn’t have much impact on me. Still this was a good assortment and I’ve got some new names to look for when I do my book shopping. Looking for a good book? 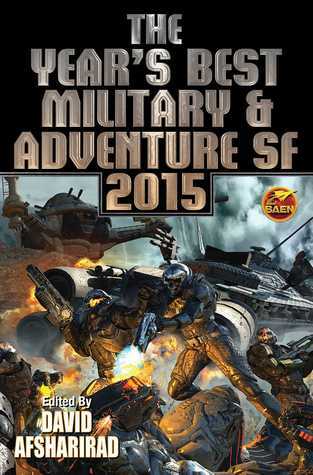 Military and Adventure Sci-Fi fans can rejoice at this anthology of The Year’s Best Military and Adventure SF 2015, edited by David Ashfarirad.